Each year, Universum surveys students to find out which potential employers they consider most attractive. 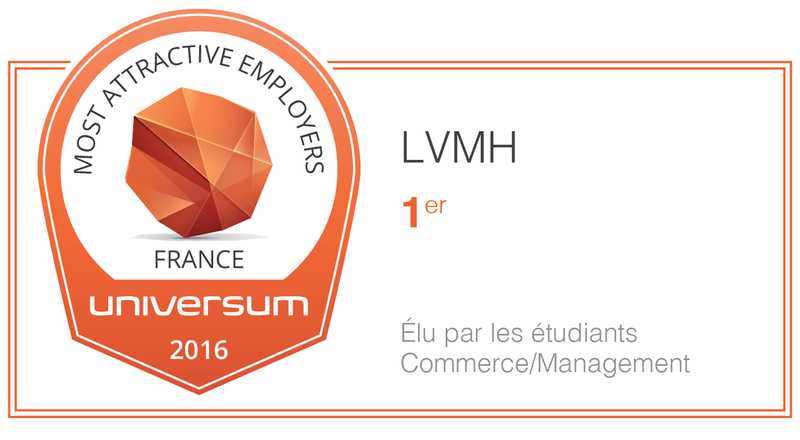 For the 11th year in a row LVMH ranked first among French students at business and management schools. For this year’s ranking Universum France surveyed 43,214 students at 127 schools pursuing degrees in 109 different fields. The survey ran from October 2015 to February 2016. Students completed a questionnaire about their professional aspirations and the attractiveness of future employers in France. The survey revealed the emergence of new criteria in assessing the attractiveness of companies among this target public, with growing importance attached to an “inspiring mission and vocation”, joined by “inspiring management” and, as the third most important criteria, “attractive/exciting products and services”. Against these criteria, LVMH ranked No. 1 for the 11th consecutive year among students at business and management schools. These results reflect the attractiveness of the Group, as well as the impact of different initiatives to engage young talents. Through its numerous partnerships with leading universities, LVMH continues to strengthen educational initiatives and communications, both at the schools and of course online. To engage directly with future and recent graduates, who place greater importance on the employer’s presence on social networks, LVMH has rolled out new digital tools in 2016. “LVMH is the world leader in luxury, and this ranking reaffirms the Group’s ability to attract and develop recent graduates. We’re proud of this repeated show of confidence, which inspires us to keep doing even better. Talented people have a vast choice, and we work every day to nourish a stimulating international professional environment inspired by strong, tangible values, starting with creativity, innovation, entrepreneurial spirit and excellence. This ranking confirms that students recognize our uniquely rich ecosystem of 70 Houses,” noted Chantal Gaemperle, LVMH Group Executive Vice President Human Resources and Synergies.